"Lying is a lot like tooth decay, really. A particle of food becomes imbedded behind a tooth, and there it sits, working its way in behind the enamel, rotting it from the inside out until there is nothing left to do but pull it. One small lie, and everything unravels from there." Novocaine seems an unusual choice for first time director David Atkins. While most rookies play it safe by choosing conventional projects, Atkins has written and directed a wholly bizarre film that will soar over the heads of many viewers. Rather than typical laugh out loud spoon-fed jokes, Novocaine relies predominately on dark and plodding humor, which is an approach that many viewers will find as entertaining as a root canal. Yet, others like myself will be impressed by how Atkins has used the style of a 1950s noir picture and taken it to a uniquely comedic level. The film follows the life of Dr. Frank Sangster (Steve Martin), a dentist with a successful practice and a seemingly ordinary life. He risks it all by having an affair with Susan Ivy (Helena Bonham Carter), a patient who expresses a keen interest to "do it in the chair." The numbness of Dr. Sangster's ordinary life quickly wears off, and the real pain sets in as he finds himself caught in a whirlwind of trouble. I was pleasantly surprised to find that dentistry is merely the root of the film, and the filling is a wonderfully biting and satirical black comedy. Many viewers will unfairly compare Novocaine against the films of Alfred Hitchcock. The elements certainly have the makings of a Hitchcock film, but in all fairness, it was certainly not the intention to mimic his dramatic style. Instead, Atkins drew inspiration while creating a more light-hearted romp. Unlike Hitchcock, the story is incredibly predictable and the characters are all overtly moronic, but much of the fun is seeing them constantly make one bad decision after another. Dr. Sangster is not only stupid, but a serious loser as well, which contributes to his innocent charm. Though the film is deeply flawed, Atkins' passionate approach has helps numb the mistakes. His father and two brothers are all dentists, yet Atkins still insisted on conducting undercover research within a real-life dentist office for six months; his dedication to detail has resulted in an honest and heartfelt film. Atkins also proves to have many interesting filmmakers' tricks up his sleeve, including several lengthy camera shots that brilliantly flow through the confines of the dental office. Novocaine features many familiar faces, including several entertaining cameos. However,most of the performances are simply mundane. This may have been intentional. The late Stanley Kubrick had a way of generating dreary performances from his actors by insisting that they repeat the same take hundreds of times, a method that proved to be surprisingly effective. While certainly no Kubrick, Atkins may have also desired melancholy performances from his actors as a way of successfully conveying the film's despondent sense of humor. Of course, I am probably reading too far into one of the film's major faults. In a strange way, watching Novocaine is somewhat like sitting in a dentist chair. There are discomforting moments, and there are times where laughter creeps up like nitrous oxide. Yet, despite any feelings of pain, overall, it is a worthwhile experience. I found its eccentric style of noir humor to be a commendable effort from first-timer David Atkins, one that has me anticipating his next outing. Image Transfer Review: The image transfer is a bit exasperating in its inconsistency, leaving me little choice but to grade the quality on a shot by shot average. One moment the colors are beautifully rendered, and the next they are dramatically off-balance. Much to my surprise, color saturation appears more soothing during the visually "warm" scenes rather than the "cool" scenes. Contrast is unstable throughout, causing the picture to appear fuzzy during lighter scenes and lacking in shadow detail during darker scenes. There is also a surprising amount of grain evident, although compression artifacts are thankfully kept minimal. Overall, the image quality is pleasing, but I expected more from a new release. Audio Transfer Review: The Dolby Digital 5.1 soundtrack is impressively dynamic. The front soundstage breathes with a wide and realistic soundfield. Particularly impressive is the nature in which the music and sound effects pound through all six channels, creating a fully enveloping sense of spaciousness. Fidelity is remarkable, and even at peak levels I did not notice the slightest hint of distortion. Surround presence mostly conveys a monaural musical score, yet split surrounds become aggressive when necessary with convincing stereo separation. Low end, while not bone-crunching, is tastefully deep and clean. The one glaring distraction is that the dialogue is predominately ADR-produced. In addition to being audibly irritating, the spoken words often times do not match with the on screen visuals, which proves to be both awkward and bothersome. Otherwise, Novocaine boasts a wholly engaging and entertaining auditory experience. Extras Review: Novocaine features a fine collection of extras that are both unique and entertaining. There is, however, one exasperating aspect that I will expand upon later. First is the feature-length commentary from the director Atkins. Atkins may be a novice, yet one would never know when listening to this commentary. He speaks like a consummate professional who seems well prepared in how to most effectively dictate such a track. Never are his comments dull or irrelevant. In addition to discussing the technical approach to the film, he also points out numerous flubs, which proves that his ego has not gotten the best of him yet. This is a tight commentary track that strengthens the impact of the film. Bitten is an eight-minute featurette discussing the art of forensic dentistry. My initial reaction was one of apathy, yet this actually turned out to be a pleasantly entertaining experience. It features interviews with real-life dentists who have solved many important murder cases using forensic dentistry. There is lots of interesting information revealed, yet I never felt as if any of it was meant to be taken too seriously. It turns out to be a fascinating learning experience that also ties in nicely with the strange comedic undertone of the film. The interesting and inimitable Bitten is undermined by the blas� and drab featurette, Getting the Shot: The Making of Novocaine. This is the usual boring behind-the-scenes feature that I have come to dislike so much. The cast and crew discuss their inspirations for working on the film, and most of them have high praise for David Atkins. The deleted scenes are all presented in nonanamorphic widescreen at a puzzling aspect ratio of approximately 2.10:1. Much of what is found here proves to be a waste of time, yet there are several comical moments as well. A bizarre jail cell moment could have greatly added to the dark comedic nature of the film. Another humorous tidbit is a Steve Martin flub, which is actually more of an outtake than a deleted scene. Next is a section highlighting the music from Novocaine. Six tracks from the film's original motion picture soundtrack are offered. Each selection gives the viewer a 30-second audio-byte of the corresponding song. While the audio presentation sounds great in crisp and clear stereo, this is essentially nothing more than a way to entice the viewer into buying the film's soundtrack. The trailer section features two very different theatrical trailers. It is quite interesting to hear how music plays such a significant factor in portraying a different mood for each trailer. Trailer number one features upbeat rock music and goofy clips that make Novocaine seem like an upbeat comedy. Trailer number two includes more of the film's dark humor, but also makes Novocaine look like more of a drama. It would have been nice to see one trailer that encompasses the film's essence. This awkward approach could account for Novocaine's lackluster box office intake. Also included in the trailer section are sneak peek trailers for five other DVDs. Rounding out the special features are production notes, as well as bios and filmographies for the cast and crew. Access to each easter egg is only granted by selecting a different track from the corresponding menu screen. Highlighting the teddy bear and hitting "enter" simply will not work. For the easter egg on the main menu screen, press "11" on the remote control, followed by the "enter" button. This will access track 11, which is a short and humorous outtake of trying to film a scene involving a rabbit. From the deleted scenes menu, press "9" and "enter" to access a baffling deleted scene. Last but certainly not least, pressing "7" and "enter" from the trailers menu screen will access a well-produced storyboard feature. 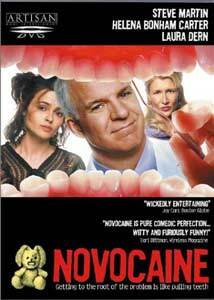 When Novocaine was released in the foreboding Fall of 2001, it failed miserably at the box office. Now available on DVD with an admirable set of extras, I urge people to give Novocaine a shot.